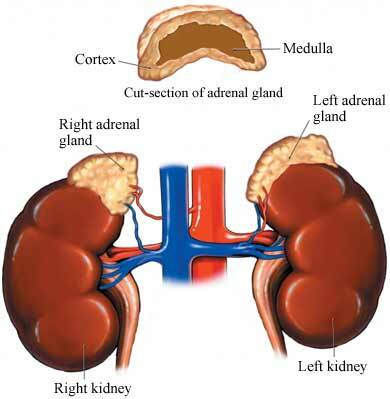 Addison disease is problem with the adrenal glands. They make hormones that help the body with blood pressure, metabolism, and the immune system. With Addison disease, the glands do not make enough of a hormone called cortisol. Aldosterone may also be low. A severe problem from this disease is the Addisonian or adrenal crisis . It can result in death. Primary Addison disease is caused by problems with the outer layer of the gland. This can happen slowly over time. Addison disease is most often caused when the immune system attacks the gland. It is not known why this happens. Secondary Addison disease can be caused by damage to the pituitary gland. This gland sends hormones that control the adrenal gland. This disease may also happen after long term corticosteroids are stopped. This disease is more common in women. You will be asked about your symptoms and health history. An exam will be done. Addison disease can’t be cured. Medicines can help replace the missing hormones and ease health problems from it. They can also help stop you from having adrenal crisis. You will need care right away if you have this. Routine blood tests are needed when you are taking the drugs. Wear an alert bracelet that states that you have this disease. This will let others know of your health problem if you can’t tell them yourself. There is no way to prevent this disease. Adrenal insufficiency and Addison's disease. National Institute of Diabetes and Digestive and Kidney Diseases website. Available at: http://www.niddk.nih.gov/health-information/health-topics/endocrine/adrenal-insufficiency-Addisons-disease/Pages/fact-sheet.aspx Updated May 2014. Accessed August 16, 2018. Adrenal insufficiency in adults. EBSCO DynaMed Plus website. Available at: https://www.dynamed.com/topics/dmp~AN~T116703/Adrenal-insufficiency-in-adults . Updated July 24, 2018. Accessed August 16, 2018. Dorin RI, Qualls CR, Crapo LM. Diagnosis of adrenal insufficiency. Ann Int Med. 2003;138(3):194-214. Hahner S, Allolio B. Therapeutic management of adrenal insufficiency. Best Pract Res Clin Endocrinol Metab. 2009;23(2):167-179. Salvatori R. Adrenal insufficiency. JAMA. 2005;294(19):2481-2488. Ten S, New M, Maclaren N. Clinical Review 130: Addison's disease. J Clin Endo Metabol. 2001;86(7):2909-2922. Thomas Z, Fraser GL. An update on the diagnosis of adrenal insufficiency and the use of corticotherapy in critical illness. Ann Pharmather. 2007;419(9):1456-65.